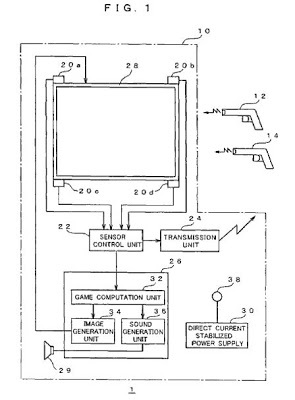 The ‘817 patent describes a method of playing a game with a gun-like controller which uses infrared light to accurately reflect the player’s movements by using detectable waves. The controller allows the player to move around in a three-dimensional world and have his movements accurately mapped out on the screen. Whenever a person locks the target onto an object, the screen will change to give the player the optimal view point. Provided is technology enabling the generation of images of high realistic sensation upon accurately reflecting the operator’s behavior. The information processing device has a controller to be used for inputting an operational instruction, and having a function of outputting a detectable wave to be used for detecting its own position and direction; a plurality of sensors for detecting the intensity of the detectable wave transmitted from the controller at mutually different positions; a position/direction calculation unit for calculating the position and direction of the controller in a real space based on the ratio of the intensity of the detectable wave detected with each of the plurality of sensors; an image generation unit for generating an image reflecting the operational instruction input with the controller, and the position and direction of the controller calculated with the position/direction calculation unit; and a display unit for displaying the image generated with the image generation unit. 1. A simulation apparatus, comprising: an information processing device; a monitor display connected to said information processing device; operational means connected to said information processing device, configured to be operable by a player and having radiation means which radiates a detectable wave expanding toward said monitor display; and a plurality of detection means disposed at mutually different positions along peripheries of said monitor display, each of said detection means being configured to detect intensity components of said detectable wave in three-dimensional directions; wherein said information processing device comprises calculation means which calculates positional coordinates of said operational means in a real space in front of said monitor display and an aiming direction of said operational means based on ratios of the intensity components of said detectable wave detected by said plurality of detection means at said different positions, wherein said information processing device is configured to: (a) calculate a scene including a first object and a second object in a virtual three-dimensional space; (b) display on the monitor display the scene viewed from a virtual viewpoint wherein said first object is located behind said second object when viewed from said virtual viewpoint in the virtual three-dimensional space; (c) convert, while the virtual viewpoint remains as set in (b), the calculated positional coordinates and the calculated aiming direction of said operational means in the real space into positional coordinates and an aiming direction in the virtual three-dimensional space so that a position of a virtual shooting point aiming at said first object along the aiming direction is set off the virtual viewpoint, which is set at the location as in (b), in the virtual three-dimensional space; and (d) determine if the converted aiming direction extending from said shooting point hits said first object.